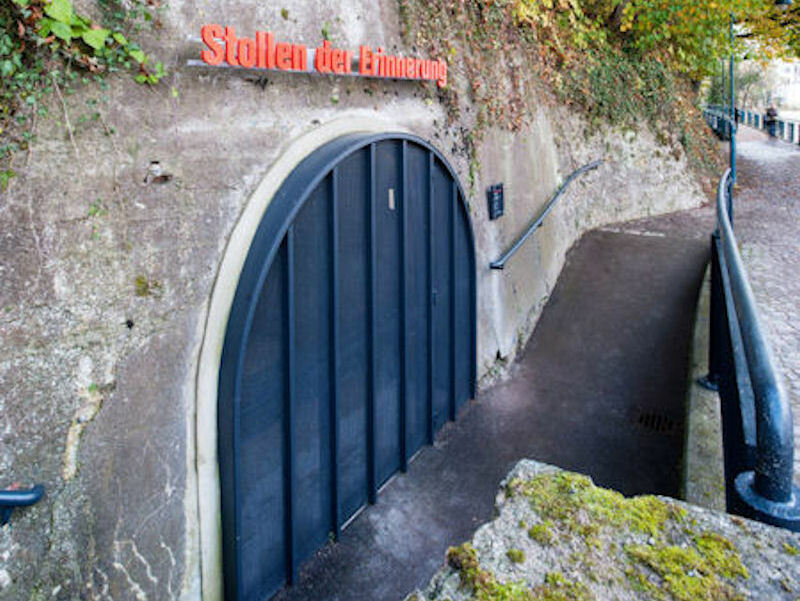 Bernhard Denkinger Architekt were commissioned by a local voluntary group to create an exhibition space in a disused bomb shelter, built in 1943 by prisoners from Mauthausen-Gusen concentration camp. Presenting a collection of artefacts collected over the past 10 years, this unique compilation is from the perspective of the inmates. 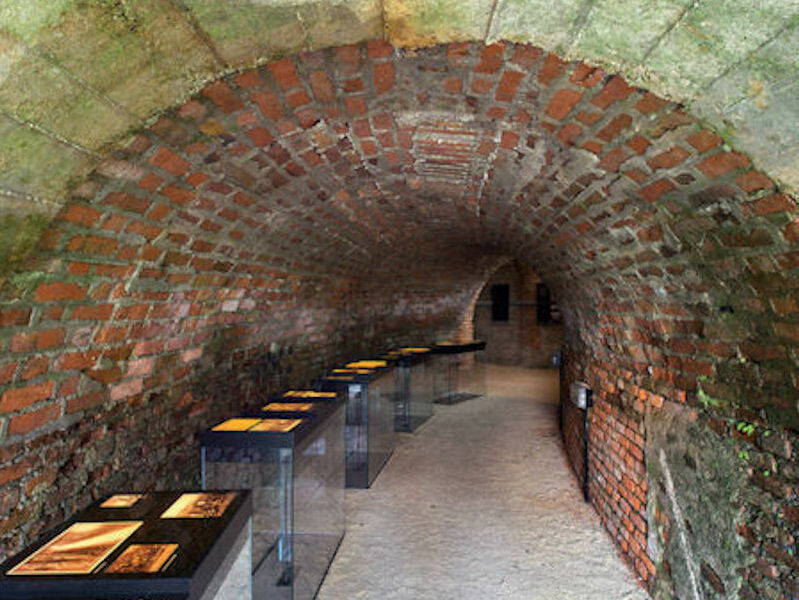 Experienced in the design of exhibitions with a holocaust theme I was contacted by the client to make a proposition on how an exhibition could be installed in this very difficult space. This first design concept should also show the disposition of the themes, as well as the structure of the exhibition. The client was a local voluntary association that looks after a concentration camp memorial and a Jewish cemetery. The association had collected material for more than ten years and wanted above all to present the perspective of former inmates. The materials had been donated or researched by members of the association in a non-systematic, often casual way. I proposed calling in external researchers to assist and to help to structure the themes. The client accepted and was involved in the process of developing the themes. The external curators emphasised structural context and proposed shifts in focus. "Social engineering" was an important aspect that had to be covered by my office. Exhibitions about the Holocaust have a highly asymmetrical collection of objects. For the most part it is documents coming from the perpetrators that have survived. Some essential facts can often be reconstructed only through eye witness accounts. Many designers attempt to compensate for these interruptions by "dramatising" exhibits, For me, paucity is part of the design concept: the squalid, makeshift, improvised and precarious also need to be shown. The structures are often made of unfinished materials or, in the case of purpose-built items, commonplace ones. The objects that can be exhibited, mostly reproductions, form a "material" layer of their own, offering visual focuses and connections independently of the extensive and usually bilingual texts. In my designs, I try to avoid the totality of an exclusive exhibition narrative in favour of the juxtaposition of various narrative fragments. I often design rooms with visual overlaps between exhibits from different thematic areas or with a connection to the outside world. A second point is the approach to the objects themselves. They are easier to read when they are grouped or placed in a series, thus giving more space and scope to highlight individual objects. Rooms with lots of objects to study place a strain on visitors, while insights and overviews provide security and allow individual access. 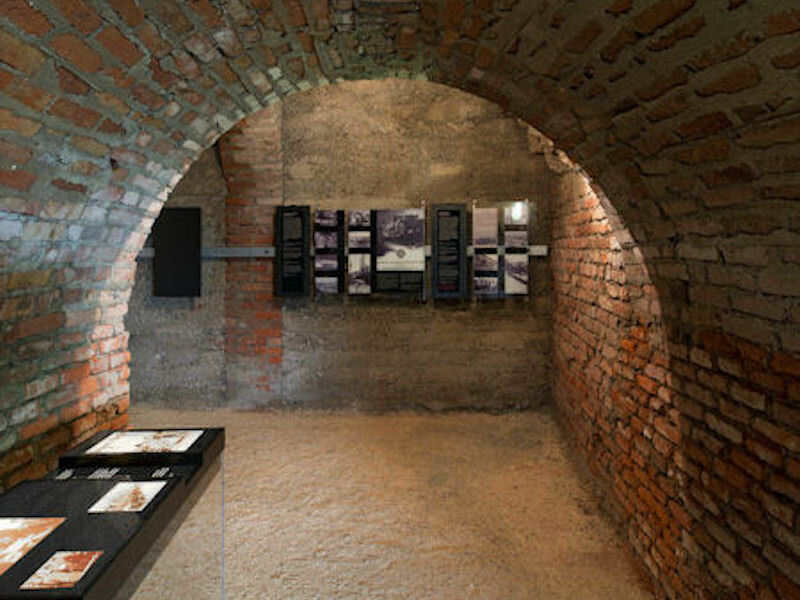 In the permanent exhibition in Gusen for example, an earlier project of my office with an holocaust theme, written documents are presented horizontally. As visitors enter the exhibition room, they are confronted initially by a small number of medium- and large-size photos serving as signposts for the individual thematic sections. The "problematic" closing sequence, which shows executions and piles of corpses, is hidden by a partition in the form of a blown-up photograph printed on textiles. The details behind the horizontally arranged documents are discovered only on closer inspection. In spite of the large number of objects and texts, the exhibition nevertheless appears expansive and airy. The 140 m U-shaped underground tunnel system, built from 1943 onwards, receives the visitors with an installation of light. 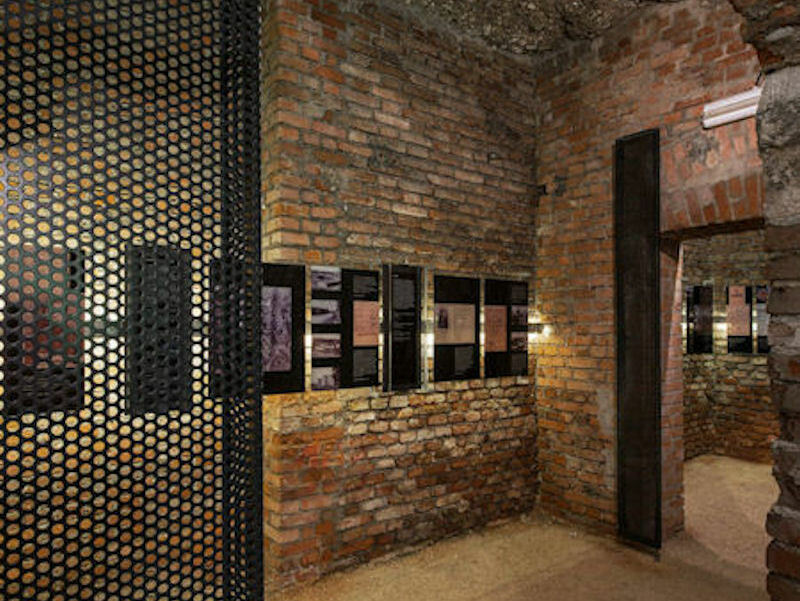 The entrance area and centre of the exhibition are highlighted by means of illuminated element. A tubular system with attached glass and sheet steel surfaces connects the illuminated stations. 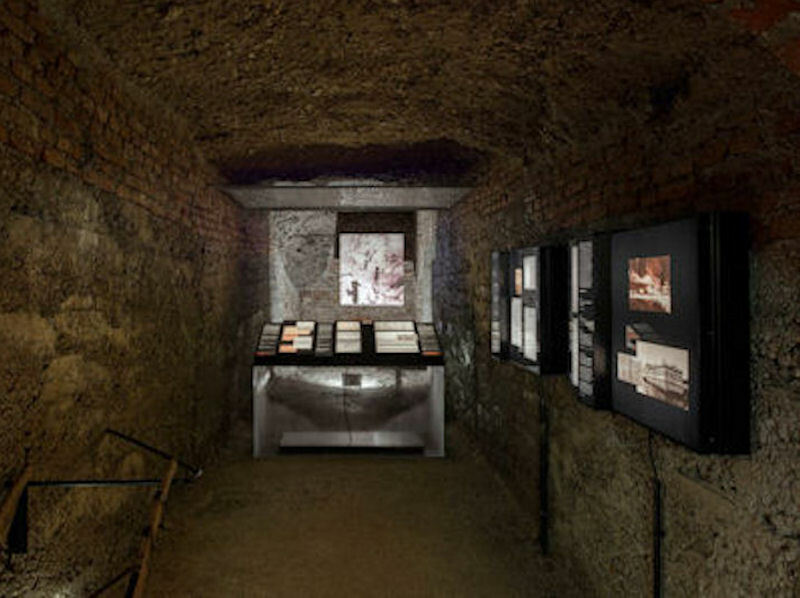 The core themes, covering the time from the establishment of the concentration camp until liberation in 1945, form a connected inner tour in the former shelter area. 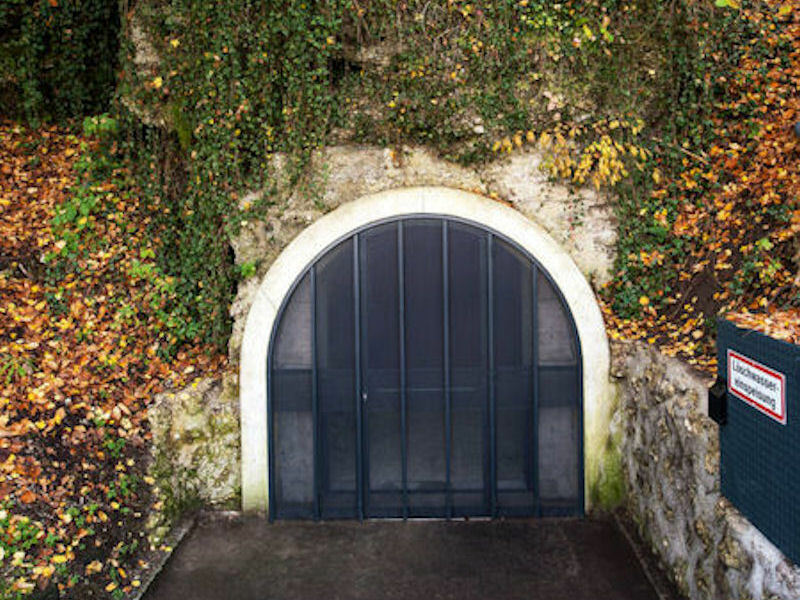 The former airlocks and the two side tunnels, two "dead ends", are sections in their own right dedicated to particular themes. New designed steel perforated metal portals framed in new exposed concrete surrounds make the tunnel profile visible from outside. A light, fine-grained floor covering is used throughout the system. Difficult geological and thermal conditions of the building, presenting high humidity and the porosity of the natural grown stone. The floor had to be lowered, electrical installation brought into the building, protection against the floods of nearby Steyr-river. The exhibition architecture attempts through the creation of defined spaces - through breaks, empty areas and interruptions to the flow - to create "windows of perception" for the particular spatial and sensory qualities of the underground structure. It divides the tunnel system into contrasting sequences: rhythmically structured paths suggesting movement, more static and contemplative sections, and short "meditative" passages that invite the visitor to stop and think. The tunnel is seen as a dark cave-like space. The light brought in from the outside 'peels' zones out of the darkness, in which the exhibition is presented. The light intensity varies during the visit. The subdued diffuse light of the 'empty stretches', which is just bright enough for the route to be seen, becomes more intense in the stations. Inside the tunnel system the light withdraws into the exhibition installations, turning them into illuminated islands standing out against the darkness. The three-dimensional design of the illuminated elements with set¬-back parts and recessed niches permits a "layered" perception with various levels containing the very diverse and concentrated pictures and documents, accounts and commentaries. When approaching the stations the impression is given of a wealth of pictures and documents or a series of texts that appear to stand out from the other exhibition documentation.